At the foot of the Vaucluse Mountains, nestled in a countryside planted with orchards and grapevines, 2 kilometers from Fontaine de Vaucluse and 3 kilometers from Isle sur la Sorgue, this 19th century stone mas, restored in the Provencal tradition, is a relaxing place for lovers of nature and peace. This pleasing dwelling will charm you with the colors of the rooms, the sober but authentic décor, its garden and trees. The summer heat has little hold on this old building whose thicwalls retain a pleasant coolness. On the ground floor to the left, furnished in an old style and in the colors of the setting sun, you will find the Serein room and its 160x200cm bed. To the right is situated the Pinson room and its beamed ceiling and 160x200cm bed. Take the stairs with their original terra cotta tiles and go up to the landing, a relaxing lounge in itself, which leads to 2 other rooms. 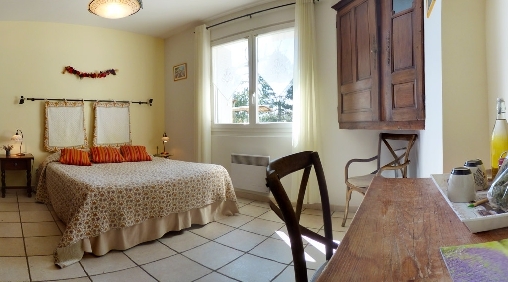 To the right at the top of the steps, open the door to the Rossignol family suite composed of one room with a 160x200cm bed, and an other with two 90x190cm beds. The rooms are connecting and both have access to the bathroom. 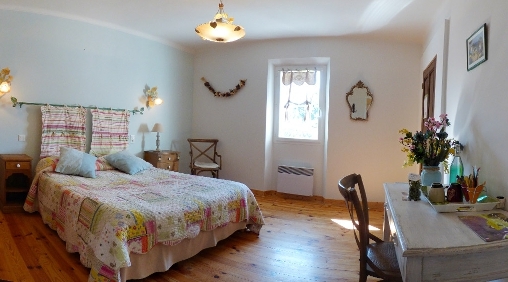 The fourth room, in back to the left, the Mesange, wax tinted in pastel green, also has a 160x200cm bed. The rooms all have a bathroom with toilet. Push open the Louis xiii door in walnut, and come discover the four rooms in their warm colors, all entirely renovated. On the ground floor to the left, furnished in an old style and in the colors of the setting sun, you will find the Serein room and its 160x200cm bed. To the right is situated the Pinson room and its beamed ceiling and 160x200cm bed. Take the stairs with their original terra cotta tiles and go up to the landing, a relaxing lounge in itself, which leads to 2 other rooms. 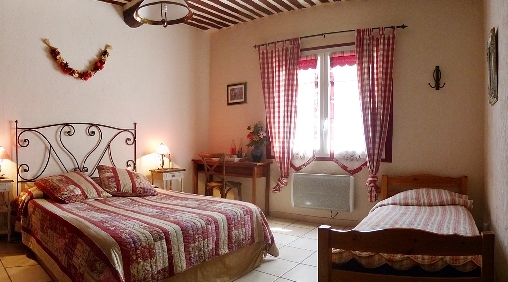 To the right at the top of the steps, open the door to the Rossignol family suite composed of one room with a 160x200cm bed, and an other with two 90x190cm beds. The rooms are connecting and both have access to the bathroom. 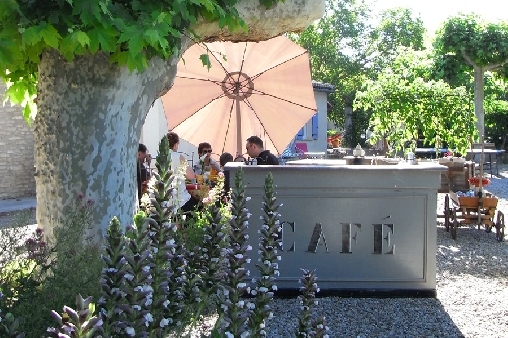 Leasure : In a wild natural setting where plants with inebriating scents like thyme, rosemary, sage grow all along your path, you will take pleasure in discovering the villages that have made the reputation of Provence. In roaming the Mountains of the Vaucluse, stop at Fontaine de Vaucluse, Saumane de Vaucluse, le Beaucet, Venasque, Murs, the Abbey of Sénanque and its lavender fields. Take a break in Gordes before continuing your excursion in the direction of Roussillon and its ochre quarries. Plan a visit to Isle sur la Sorgue to see its antique dealers and Thursday and Sunday morning markets. 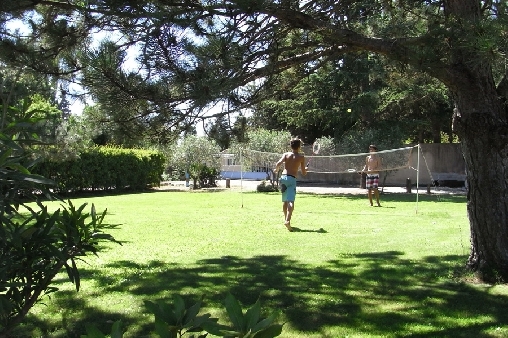 On the premises: Parking, piscine, ping-pong, pétanque, mountain biking, hiking. miniature golf, horseback riding, accrobranches. Join the D5 between Isle sur la Sorgue and Fontaine de Vaucluse (at the Y don't take the direction Saumane). Passing through the entrance of the "Golf de Provence" direction Fontaine de Vaucluse. 300m later, on your right enter the Chemin de la Cornette. 200m later (after a long stone wall)you'll find "Le Mas des Hirondelles" on your left side. Have a good trip.